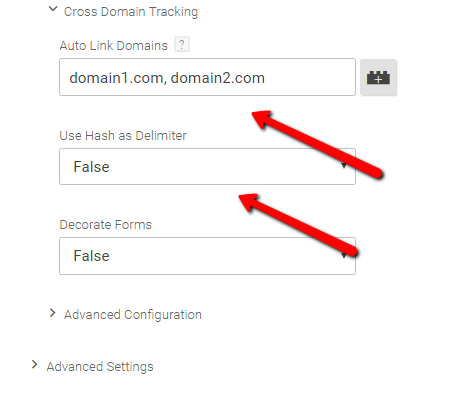 Google Tag Manager makes it very easy to set up cross domain tracking. Traditionally, without a tag management platform, the Google analytics code had to be altered to share data between the two domains. If you don’t have a tag manager you modify your existing code script by adding. You can access the code by entering your admin console. Then you can modify the code with the below. Open up Google Tag Manager and Choose your Container. Chose your Google Analytics Tag (If you are not using Google Tag Manger to deploy your analytics tag you should migrate it over). Under Field Name, choose allowLinker and under value, type true. Under Hash Delimiter, leave False and Under Decorate Forms, leave False. After setting the allowLinker field, you can set the cross domain tracking for the two domains that are needed.